A community land trust (CLT) is a not-for-profit organisation that is made up of community members. CLTs are a way for communities to build, bring back into life or protect buildings and services that are important to them. Projects that CLTs have taken on include building and renovating houses; taking over the running of local pubs and shops; creating play areas and nature walks; and building workspaces. But for this website, the focus is on how CLTs can build and renovate housing. For a community land trust, the mission isn't simply to create something. It's to make sure it is of real benefit to the community and remains so in the long-term. 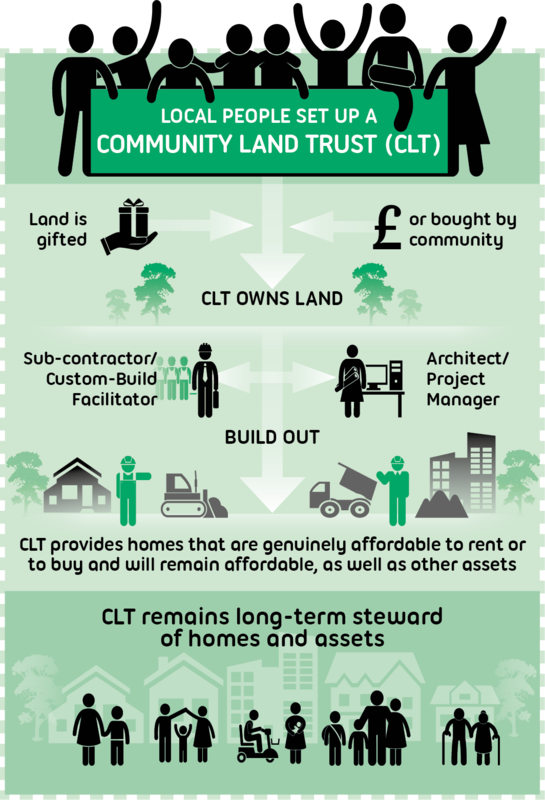 Put very simply and illustrated nicely in the infographic at the bottom of this page, first, CLTs acquire land, either by buying it, on a long-lease or as a gift, the CLT then oversees the development of affordable housing to rent or buy and when the homes are complete the CLT remains a steward. CLTs build homes that normal people need and can afford. Many groups are taking a radical approach to how they calculate rent and sale prices by taking houses out of the market and tying costs to what local people earn. This means living costs can be dramatically reduced. It's not just the current residents that benefit from the lower housing costs. An asset lock means the affordability is legally protected so that future residents will also benefit. Homes cannot be sold for inflated profits, and any extra money that a CLT earns or raises must go back into the pot to be used for community benefit.